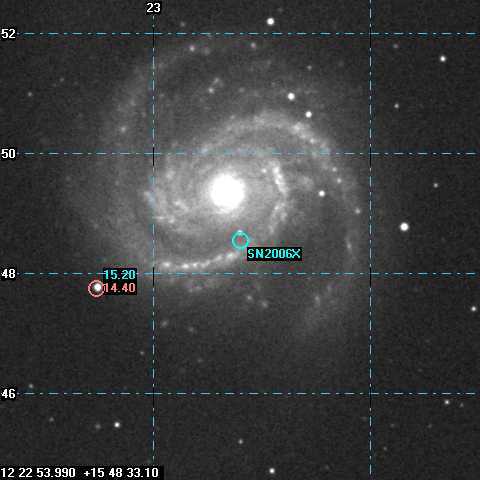 Join the useful game of supernova stars observation and due documentation preparation. On our site you can find information about objects that we bring to your attention and about methods of their brightness determination. We have also prepared for you an interactive system for entering your results into the database of supernovae that are observed as a part of our project. Aktualizacja: 17.09.2006 – Lech Mankiewicz, administrator euhou.net. Two 2m optical telescopes, located in professional observatories, are dedicated to education in the UK. The EU-HOU pilot schools will have access to observing time during 2005-2006. Collaborations with British schools will be strongly encouraged. The following beginners exercises have been created by the Faulkes team in the UK for use with the SalsaJ software developed for EU-HOU. The exercises highlight the background science of how astronomers are able to produce the fantastic images that are commonly seen on the internet, television and printed media. Teachers and pupils are given step by step guidance on how to take their own images of celestial objects and get the best results from their observations. These Images were taken during a live observing session at October 21st by participants of the I EU-HOU Teachers Resource Agent Workshop in Torun, Poland. The session was organised by Robert Hill and Lech Mankiewicz with a generous support of Faulkes Foundation.